Farmers & workers deserve fair livelihoods, & families around the globe need healthy, nourishing, culturally-appropriate food. The movement for a fair food system that nourishes people and the planet is growing. Yet for far too long, our food system has instead prioritized cheap food and corporate profits above all. That’s a race to the bottom that is squeezing family farmers and workers alike. Meanwhile, chemical fertilizers and pesticides are sickening people and the environment. Clearly, it’s time to transform our food system. Family Farms: Small-scale farmers produce approximately 70% of the world’s food on just 30% of the land, yet they are getting squeezed from all sides. Around the globe, corporate agribusiness is consolidating their grip on seeds and chemical fertilizers and pesticides. Investment firms and multinationals are grabbing up farmland, and consolidation is leaving small-scale farmers competing in a market that is ever more skewed against them. Global trade deals cement these inequities. Farmworkers: The people who tend and harvest our food are essential to our food system. Yet globally they are also some of the most marginalized and exploited. Even in countries like the U.S. with relatively strong labor laws, farmworkers are often exempt from protections granted other workers. Hazardous chemicals, dangerous equipment, long days in all weather, low wages and even forced labor are just a few of the challenges that they face. Food Sovereignty: The food we eat is itself getting transformed by our industrial food system. Corporate consolidation and a global drive for profits are genetically modifying staple crops, editing genes, patenting vital life-giving seeds, and hooking farmers on their chemical fertilizers and pesticides. The crops that get subsidized cater to the needs of this food system too, with healthy fruits and vegetables losing out to corn and soybeans, and a growing menu of junk food. We believe that a fair food system is possible. Farmers and workers all along the food chain deserve fair livelihoods, and families around the globe need access to healthy, nourishing, culturally appropriate food. That’s why we offer ways to advocate for fair policies and better choices every time you shop. 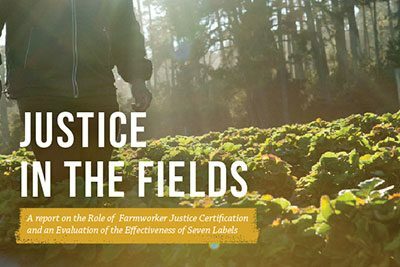 This report examines some of the key challenges facing farmworkers and reviews seven of the eco-social certifications that appear on our food. We analyze issues from empowerment to safety, housing to wages, and enforcement. Four programs are found to have strong standards and good enforcement to ensure worker welfare. 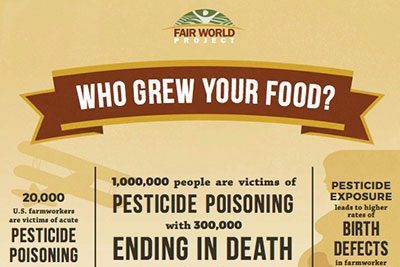 A short, visual resource tells a story of the people who grow our food in a few compelling statistics. The backside includes resources to support farmworkers and a more fair food system when you shop and every day. Synthetic biology, nanotechnology, GMOs. This short fact sheet breaks down the buzzwords. 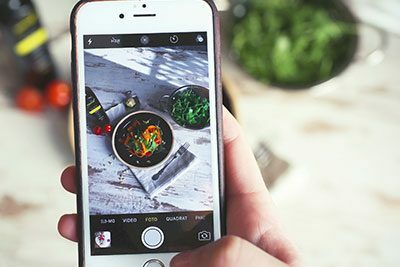 We also analyze the risk of these emerging technologies to farmers, communities, farm workers, eaters, and the environment.